Dig deep enough into the clannish histories of any smaller city in America and you’ll find lines of immigration that darken well-trodden paths from even smaller places all over Europe. Relatives bring relatives, childhood friends invite childhood friends, and soon enough you have neighborhoods called Little Italy or Polish Town where a handful of names encompass a dense intermarriage mosaic tracing back to some obscure place in the Old Country. It could be said that Duluth was built on the backs—and wallets—of one such group, hailing from the Isle of Lewis, the largest island in the Outer Hebrides of Scotland. The exact numbers of Lewis men and women who set down roots in the Twin Ports are unknown, but for an island most people have never heard of, easily over a hundred were here by the 1880s, bringing with them traditions and especially music that must have been heard by teams of construction workers throughout the building boom of the time. Before Duluth was even a thought, there were Lewismen plying the waters of Lake Superior in the employ of the iconic Hudson Bay Company, who prized fur traders from the Isle of Lewis for their hardiness and ability to maintain good relations with the local Native Americans. Both Macfarlane and Maclennan brought their families to Duluth to settle. Maclennan’s wife Julia was a Stornoway Macleod, and her father Roderick and brothers John and Roland soon followed in turn. The Macleod family’s construction business had a hand in building many of Duluth’s early buildings, including both St. Mary’s and St. Luke’s hospitals, St. Paul’s Episcopal Church, the Kitchi Gammi Club, McDougall’s Duluth Shipyard, and the Sellwood, Glass Block, Columbia and Northern Cold Storage buildings—not to mention many of the grain elevators in the region. William’s son, Donald R. Maclennan, began his Duluth insurance career around 1894, eventually co-founding Marsh & Maclennan Co., now one of Wall Street’s largest brokerage firms. You may remember them as the company whose offices in the World Trade Center were completely wiped out during the September 11 terrorist attacks. Other Lewismen involved in Duluth’s early grain business included Thomas Gibson, Roderick R. Macfarlane, and Donald Maciver. Thomas Gibson was related to Andrew Gibson, a fish merchant who came here in 1884. Murdo Gibson, one of Andrew’s sons, became somewhat famous as an outdoorsman, a writer with the Izaak Walton League, and an outfitter. A 1928 article about him in the Duluth News Tribune extols Murdo’s adventurous spirit, listing his accomplishments as dog musher, Klondike prospector, lumberjack, timber cruiser, forester, philosopher and cowboy, not to mention his youthful exploits as an adventurer in the American West, where he was a poolroom marker, muleskinner and railroad bum—those last all before age 18. Two of Duluth’s prominent early grocers were from the Isle of Lewis. Alexander M. Morrison opened a grocery store here in 1876, and Simon Clark started his grocery in 1880. He eventually became a national leader in the Grocer’s Association, the manager of the Duluth Marine Supply Company, and a major player in Duluth’s civic and charitable affairs. Another Lewis descendant was D. B. MacDonald, who was involved in early mining exploration on the Iron Range, banking, founder of Cole McDonald Exploration Co. and president of the Zenith Dredge Co. His son Donald C. MacDonald inherited a role in Zenith Dredge, bringing it successfully into the war effort during World War II. Notably, he was also a leader in Superior Wood Products—later known as Superwood. 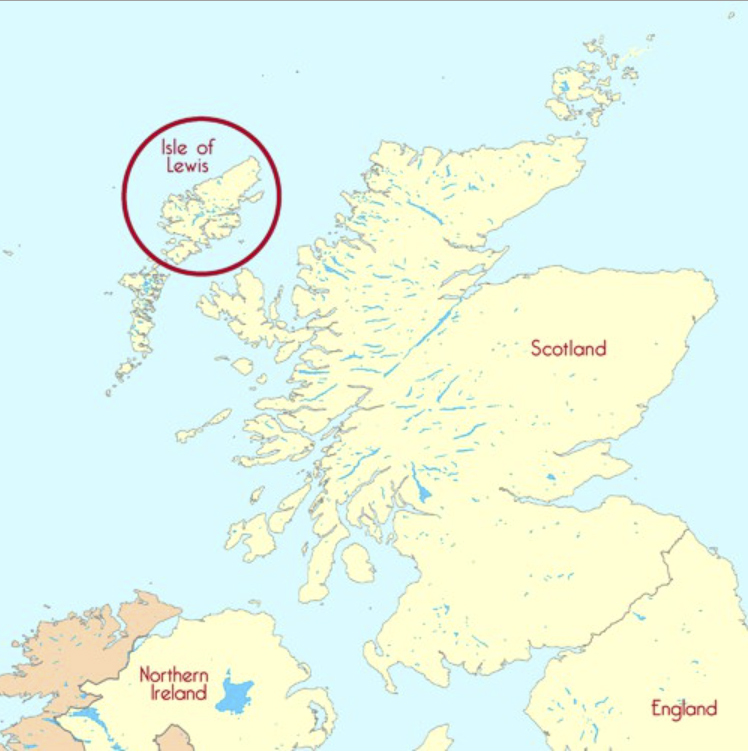 The name of the Isle of Lewis comes from the Gaelic Leodhas, which some scholars think comes from a Norse word meaning “song house.” This is appropriate because it seems that much of early Duluth culture was influenced by the music brought by these Scots. Donald M. Morrison, who came here in 1886, became known in Duluth as “The Bard of Lewis” because he was an authority on the Gaelic language and wrote and composed many Gaelic songs. Another Duluthian from Lewis was John Matheson, an award-winning singer as a child in Scotland and participant in the 1940 National Folk Festival in Washington D.C. Twenty-nine of his songs were recorded and preserved in the Library of Congress by prominent folk song researcher Sidney Robertson Cowell. Today, most obvious traces in Duluth of its Lewis men and women forbears are gone, but there still remains Lewis Street in the Glen Avon neighborhood, named by Angus Macfarlane in honor of his homeland.